Students attend classes once a month (on a Friday 9 am – 4 pm and Saturday 8:00 am – 2:30 pm) and receive classroom and hands-on instruction. Students are required to complete a minimum of 20 assessments and case studies between classes. Students are responsible to study the texts and material supplied by the College. There are 3 research projects that must be completed and handed in during the course of study. Students must be prepared to spend, on average, two to three hours per day to complete the practical homework, course study and research components. Total hours for the course will be 2000. 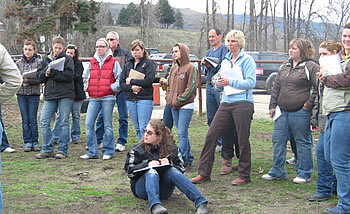 Students receive a quiz at the beginning of each class and are required to submit their case studies of animals worked on. In September of the second term, students write a midterm paper covering all the material presented in the first term. Instruction is presented in two sets of modules which run from September until June the first year and from September until June the second year. 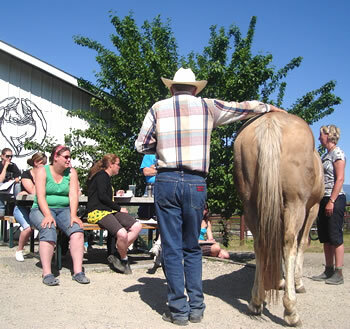 We also enjoy a field trip to local equestrian facilities during the two years. Classes are held on Friday 9:00a.m. – 4:00p.m. and Saturday 8:00a.m. – 2:30p.m. (1/2 hour for lunch) from September to June. You are notified of the dates upon acceptance to the program. We accept approximately 24 students to ensure personal time. Registration fee of $250, Administration fee of $250 and first Tuition payment of $600 are all due upon acceptance. First year tuition total is $5,850.00 plus a $10 archival fee. The second year tuition is $2,500.00 with a $250 Administration fee and a $10 archival fee. Cost for textbooks and course material is $835.00 and is due first day of class. This figure could change slightly depending on the U.S. dollar. Textbooks and College manuals are handed out on your first day of class. You can apply by mail or online. See “How to Apply” for more information. Please contact us if you have not received an email confirming receipt of your application.